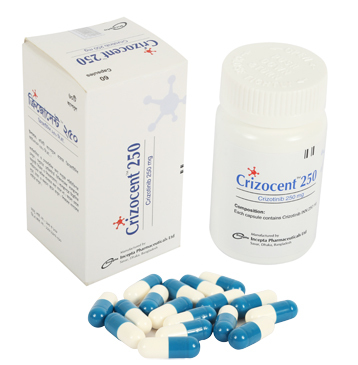 Crizotinib is an inhibitor of receptor tyrosine kinases including ALK, Hepatocyte Growth Factor Receptor (HGFR, c-Met), ROS1 (c-ros), and Recepteur d’Origine Nantais (RON). Translocations can affect the ALK gene resulting in the expression of oncogenic fusion proteins. The formation of ALK fusion proteins results in activation and dysregulation of the gene’s expression and signaling which can contribute to increased cell proliferation and survival in tumors expressing these proteins. Crizotinib demonstrated concentration-dependent inhibition of ALK, ROS1, and c-Met phosphorylation in cell-based assays using tumor cell lines and demonstrated antitumor activity in mice bearing tumor xenografts that expressed echinoderm microtubule-associated protein-like 4 (EML4)- or nucleophosmin (NPM)-ALK fusion proteins or c-Met. • Renal Impairment: 250 mg orally, once daily in patients with severe renal impairment (creatinine clearance <30 mL/min) not requiring dialysis. No starting dose adjustment is needed for patients with mild (CLcr 60-89 mL/min) or moderate (CLcr 30-59 mL/min) renal impairment based on a population pharmacokinetic analysis. Increased exposure to crizotinib occurred in patients with severe renal impairment (CLcr <30 mL/min) not requiring dialysis. Crizotinib should be administered at a dose of 250 mg taken orally once daily in patients with severe renal impairment not requiring dialysis. The safety and effectiveness of Crizotinib in pediatric patients have not been established. The most common adverse reactions (≥25%) are vision disorders, nausea, diarrhea, vomiting, edema, constipation, elevated transaminases, fatigue, decreased appetite, upper respiratory infection, dizziness, and neuropathy. Based on its mechanism of action, Crizotinib can cause fetal harm when administered to a pregnant woman. There are no available data on the use of Crizotinib during pregnancy. Females of reproductive potential should be advised of the potential risk to a fetus and use of effective contraception. There is no information regarding the presence of Crizotinib in human milk, the effects on the breastfed infant, or the effects on milk production. Because of the potential for adverse reactions in breastfed infants patients should not breastfeed during treatment with Crizotinib and for 45 days after the final dose.